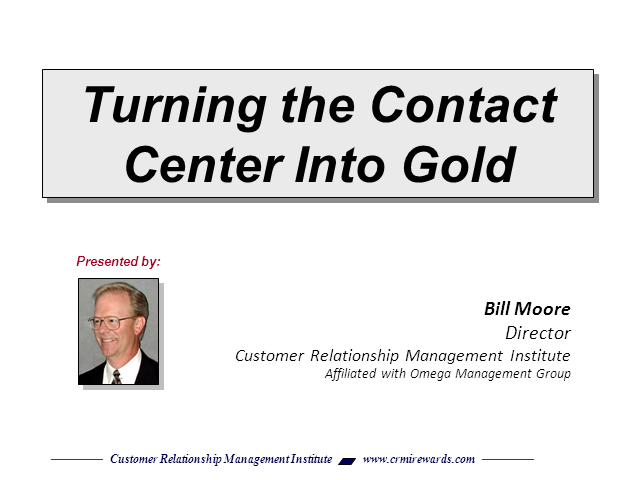 Join Bill Moore, Director- Customer Relationship Management Institute in a discussion about keys to operating a successful contact center. With companies scrambling to find other revenue streams to boost their bottom lines, the contact center is increasingly becoming a P&L entity within organizations. But in order to maximize this golden opportunity, companies need a game plan. In this presentation, you will learn about the CEMDNA Playbook Strategy, which will give contact centers the road map to implement a successful strategy that leads to increased revenues and profits. We will focus on key areas including: survey methodology; benchmarking contact center performance ÂÂmeasuring both agent performance and customer loyalty; aligning contact centers with key accounts; engaging employees by linking compensation to satisfaction; and building an ROI model.